Directions: Solve as many as you can of the problems and list your solutions on this sheet of paper. On separate sheets, in an organized way, show how you solved the problems. You will be awarded full credit for a complete correct answer that is adequately supported by mathematical reasoning. You can receive half credit for correct answers that are the result of guesses, conjectures or incomplete solutions. Included as incomplete solutions are solutions that list some, but not all, solutions when the problem asks for solutions of equations. The decisions of the graders are final. You may earn bonus points for "commendable solutions"- solutions that display creativity, ingenuity and clarity. Your answers and solutions must be postmarked by November 1, 1999 and submitted to Tony Trono, Vermont St Mathematics Coalition, 419 Colchester Avenue, Burlington, VT 05401. 1. The buyer for Green Mountain Books, trying to anticipate demand, was planning to order 21 copies of a biography of Bill Clinton and 21 copies of a biography of Hillary Clinton. The store owner recommended an order of 28 copies of a biography of George W. Bush. The two of them then decided to purchase an equal number of copies of each of the three biographies. In all of the three cases, the books ordered would have cost the same thing. How many books were ordered? 2. The array of numbers contains 13 positive integers with four of them known and nine of them unknown. 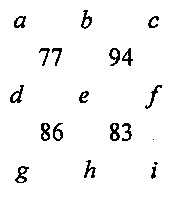 Each of the four known numbers is the sum of the four unknown numbers that form a square around it (for example, e + f + i + h = 83). Furthermore, e, g, b, f are each 19 greater than a, h, i, d respectively. Evaluate the sum a + e + f + g.
3. 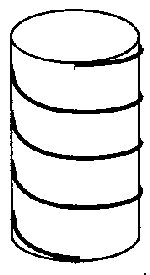 A cylinder with circular cross section has length 16 inches and circumference 3 inches. A string is wound around the cylinder four times with the ends of the string at the top and bottom of the cylinder and one end of the string directly under the other end. Find the length of the string. 4. The function f(x) satisfies the equation f(2 - x) = f(2 +x) for all real numbers x. The equation f(x) = O has four distinct real roots. Find the sum of these roots. 5. Find the smallest real number x satisfying the equation (log3 x)3 -log3(x3)=(log3x)2 - log3(x2). Round off your answer to two decimal places. 6. The slope of AB is m, where m>1. BC AB, CD BC, and DE CD. If the length of AE is three times the length of AC, then find m.
7. The roots of x2 +ax + b=0 are the squares of the roots of x2 + 2x +3=0. The roots of x2 +cx + d = 0 are the cubes of the roots of x2 +ax + b=0. Find the numerical value of c + d.
8. 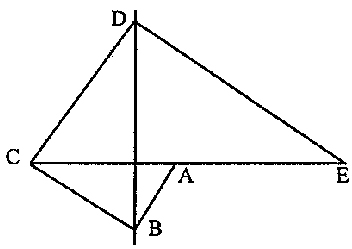 A 12 by 12 square is divided into two parts, where Part I is an isosceles right triangle and Part II is the remainder of the square. 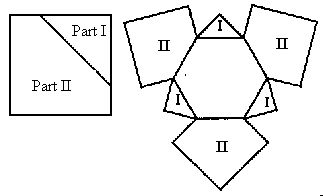 A regular hexagon has three copies of Parts I and II placed around it as pictured. When the six parts are folded upward (with folds along the edges), a solid is enclosed within the seven faces. Find the volume of the solid.